Today’s Nice Price or Crack Pipe Bimmer pushes a lot of the right buttons. Let’s just see if one of those is the sold button. Aussie! Aussie! Aussie! Oy! Oy! Oy! In what was an obvious nod to law and order, yesterday’s Australian-built ex-cop car 2012 Chevy Caprice earned itself a massive 69% Nice Price win for its modest price and immodest spec. I’d say... justice was served. Hey, are you, shall we say, a bit emotional about how things are going in the U.S. these days? Well, maybe today’s candidate will make you feel a little better. What we have here is a 1989 BMW 325iX Touring, imported and apparently all ready to go on American soil. That’s right, this is an E30 wagon, that forbidden fruit of one of our favorite 3-series lines, fitted with a silky smooth straight six, five speed stick and AWD. It’s like finding a four-leaf clover, and then discovering that it was covering a leprechaun’s pot of gold and that the leprechaun is actually Sofia Vergara, and she’s feeling charitable. Okay, so it’s not THAT rare. In fact, we actually had another one here a couple of years back. Still, that doesn’t make it any less chub-inducing. Those of you in Europe are probably once again making dismissive fart noises and asking why ze Americans alvays zink zese are zo zpecial? And yes, I assume all Europeans speak with a cartoony French accent. Don’t you judge me. Look, we never got these over here, okay? It’s like affordable health care and a living wage, we’re simply denied them for some unfathomable reason. At least we still have yoga pants and the grey market. In fact, that’s what Americans do best which is to take matters into our own hands and make a difference, and that’s why we have a grey market. Someone somewhere did just that, importing this 89 E30 wagon on their own dime. ‘Murica, eff yeah! What they got was a 169-bhp 2.5-litre M20 engine, Getrag 260 five-speed gearbox and an AWD system that back in the day Car and Driver rated as a better all-weather ride than Audi’s venerated Quattro. Oh yeah, and it’s one of the most handsome wagon bodies ever made too. It comes in Alpine white over black leather, and rocks a set of deep dish Konig Roller wheels. The body looks impressively straight, evidencing only some minor issues here and there… and there. The engine compartment looks reasonably clean as well. It’s free of any questionable mechanical monkey business aside from one strut cap being oddly bent on its off-side. Yeah, I don’t know what’s up with that either. The interior likewise presents well, with a dash that appears crack-free and an M-sport tiller for your driving delight. The passenger door hosts a cup holder right out of JC Whitney, but otherwise things look pretty composed. There’s 155,000 miles on the clock, and just keep in mind that that clock is in kilometers. So is the speedo but remarkably both of those are said to still be working. No mean feat on a BMW of this age. In the back there’s a dog net to keep fido from fighting you for a turn behind the wheel while up front the smilies get their own little wipers that are just as cute as cute can be. Okay, so I guess that I’ve made it pretty clear that I like this car a lot. I’m pretty sure that one or more of you feel the same way too. Let’s just see if its price is as appealing as well. That is $13,900, which is Kia Rio or two-year old VW Jetta S money. Both of those cars will be tighter and more efficient than this old Bimmer, but neither will be anywhere near as cool or fun to own. 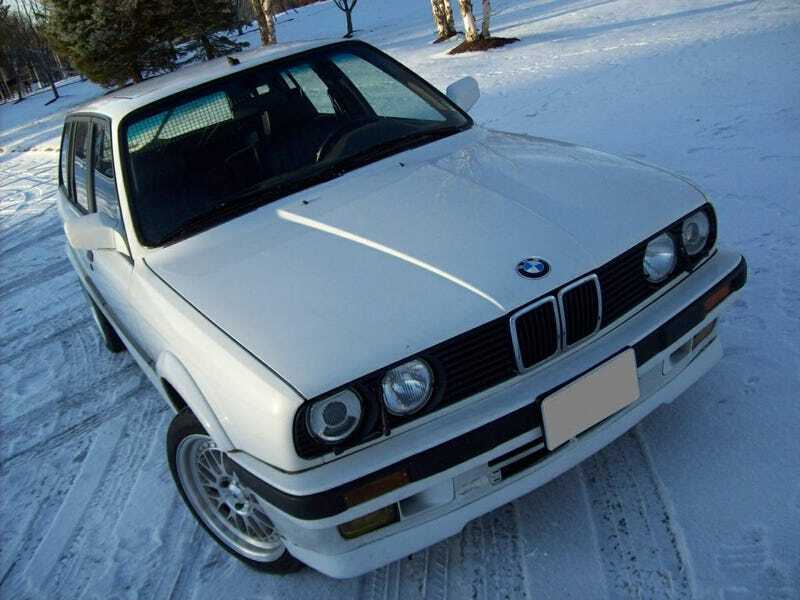 The question is: could this 325IX be $13,900 worth of fun? Two Pickets to Tittsburgh Craigslist, or go here if the ad disappears.